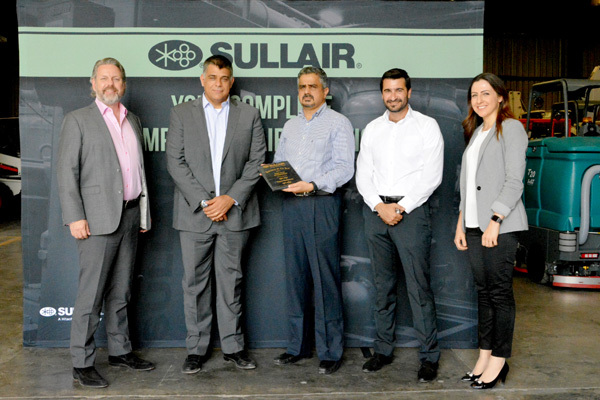 Kanoo Machinery, a fully owned business division of Yusuf bin Ahmed Kanoo Group, has won “The Distributor of the Year” award for the region from Sullair, a Hitachi Group company which specialises in manufacturing high-quality air compressors. Kanoo Machinery is a major provider of construction equipment, mobile cranes, and material handling equipment. The business, which was established in the early 1960s, operates showrooms and distribution channels across the region in countries like Bahrain, Saudi Arabia, UAE and Oman. Sullair has been a pioneer of compressed air solutions, for more than 50 years. It owns manufacturing facilities in the US, China and India; all ISO 9001 certified. The company won the recognition for the second successive year, and the award was presented to Kanoo Machinery management in a ceremony held at Sullair headquarters in Michigan, US, said a statement. “Winning the award for two years in a row reflects how dedicated our teams are towards achieving excellence,” he said.